For Bernard Tschumi, there is no architecture “without event, without activity, without function; architecture must be thought of as the combination of spaces, events and movements, without precedence or hierarchy between these terms.” Thus, the architect replaces the idea of architectural form with the idea of movement and event, which underpins the conception of the Parc de la Villette in Paris and numerous other projects. The idea of architectural unity yields to those of heterogeneity and fragmentation; the one of fixed and hierarchical form gives way to the dynamic; finally, the one of synthesis is replaced by disjunction. A key participant in architectural debate in France since the 1970s, Tschumi has been developing a theory that draws from Russian constructivism of the 1920s and blends the fields of diverse disciplines: the literature of Georges Bataille, the philosophy of Jacques Derrida, the structuralism of Roland Barthes and Michel Foucault as well as cinema. These interferences have nourished a specific approach to the project, which for Tschumi must begin with the concept. His buildings never come across as simple containers or as direct responses to a context. Rather, they are understood as amplifications, dissonances, and even local contradictions. The Pavillon de la vidéo (1990), the Fresnoy (1991-1997), l’École d’architecture de Marne-la-Vallée (1999), the École cantonale d'art et de design à Lausanne (2007), the New Museum of the Acropolis in Athens (2001-2009), the Interface Flon in Lausanne (2001), the Zénith in Rouen (1999-2001) and the one in Limoges (2007) or the Parque Atmosfera in Santiago, Chili (2010), all provide examples of Tschumi’s masterful implementation of concepts, based on the “in-between”, circulation and light as the wellspring of events. Following his studies in Paris and at the Polytechnic School of Zürich, Bernard Tschumi (1944, Lausanne), son of the Swiss modernist architect Jean Tschumi (1904-1962), began his career in teaching at the Architectural Association in London from 1970 and 1980, followed by the University of Princeton (1980-1981) and the Cooper Union (1980-1983). During this period he focused on developing his theories and writing “Manifestos”, the Manhattan Transcripts and the Screenplays. These books provided the intellectual foundations for a series of experimental constructions, the Follies. Several essays followed this experiment, and they were eventually assembled and published in his book Architecture and Disjunction (1996). He opened his firm in Paris in 1983, then a second one in New York in 1988 (Bernard Tschumi Architects - BTA), which in 2002 became Bernard Tschumi urbanistes Architectes (BtuA). Tschumi earned his place as one of the major builders of the “deconstruction” movement in France with one of the most prestigious public commissions of the 1980, the redevelopment of the Parc de la Villette. 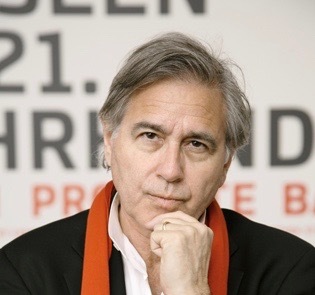 Dean since 1988 of the faculty of architecture at Columbia University in New York, member of the International College of Philosophy, Officer in the French Order of Arts and Letters, Bernard Tschumi was awarded in 1996 the French National Grand Prize of Architecture for the Fresnoy Art Center (Tourcoing, 1991-97). Many of his other works have won prizes as well and have been exhibited internationally ((MoMA, Benice Biennale, Centre Pompidou…).